Recruiters are very busy people, short on time and patience. With hundreds of applications to sift through for every vacancy they advertise, they are always looking for quick and easy ways to sort the best candidates from the time-wasters. Attention spans are short and time is of the essence when they’re looking to fill vacancies, so recruiters will often spend just seconds making snap decisions about a candidate’s viability. From the moment they open your application, recruiters will be on the lookout for signs you are professional, committed, and serious about the job on offer. While some resumes will shine and some applicants will do well during the interview, others will have recruiters seeing red. 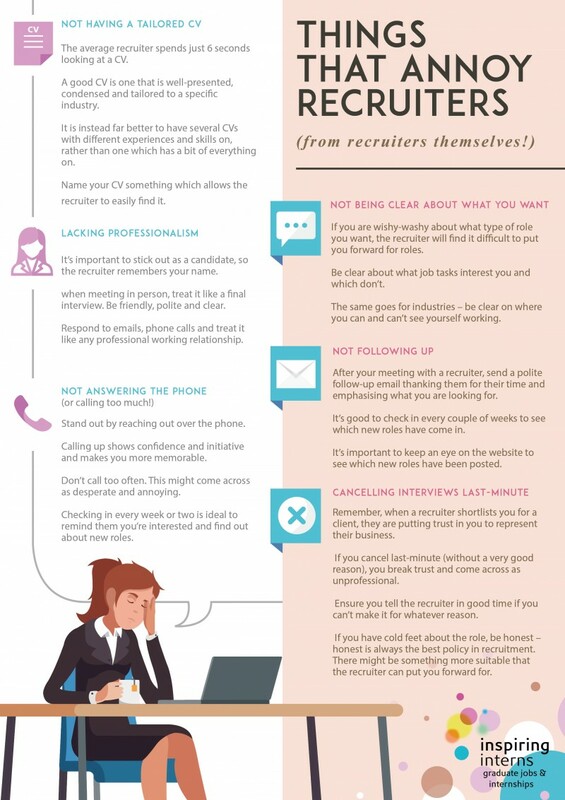 If you don’t want to annoy recruiters and rule yourself out of the race straightaway, there are certain things you should avoid doing. This is about so much more than spelling mistakes in your cover letter. It’s important you put across your best and most professional self, both on paper and in person. Lizzie Exton read English literature at the University of Liverpool and received a master's degree from King's College London. She now works as a freelance writer and editor, writing on careers, business, lifestyle, and more.